Spoiler alert…. Our upcoming equity sector commentary for October will reveal that our funds are largely underweight the Consumer Discretionary sector. Naturally, you must be asking yourself, “well why is that? !” There are a variety of reasons that we have been avoiding discretionary stocks as a broad basket, and further building that underweight as of late. Valuations are stretched. On most any valuation metric, discretionary stocks are trading above their historical norms. Consumer Discretionary has been by far the best performing sector since the 2009 lows, and with that has come significant multiple expansion. Income growth in the U.S. has been stagnant since 2009. For the most part, discretionary stocks are “needs.” Lackadaisical wage growth and less willingness by consumers to “lever-up” puts the sector at risk if these metrics don’t strengthen. 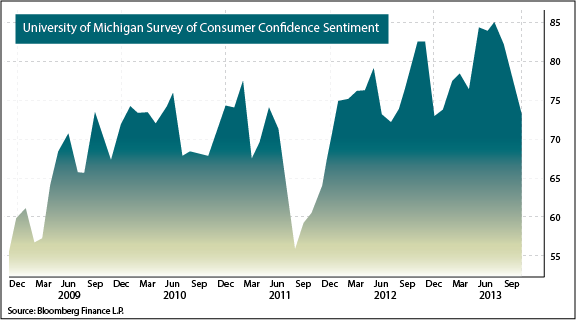 Consumer confidence is an important metric for the economy as a whole. Overall, the metric has been improving which is great to see. However, Washington has typically had a large influence on consumer confidence, and the past several months have been no exception. Not surprisingly, Consumer Discretionary is the most correlated sector with consumer confidence. The list continues as discretionary stocks have limited leverage to improving international markets relative to other sectors. Somewhat against common perceptions, discretionary stocks historically underperform during seasonally strong months of December and January – threatening the continuation of the sector’s strong momentum. We’ll continue to monitor the health of the U.S. consumer, as a healthy consumer obviously benefits everyone. It may be that high-flying discretionary stocks have already discounted future consumer strength. While there are certain sub-industries in the sector with potential, the current risk/reward for allocations to U.S. Consumer Discretionary stocks remains unattractive relative to other cyclical sectors.